This is one of my all-time favorite soups. This recipe was my mom’s. 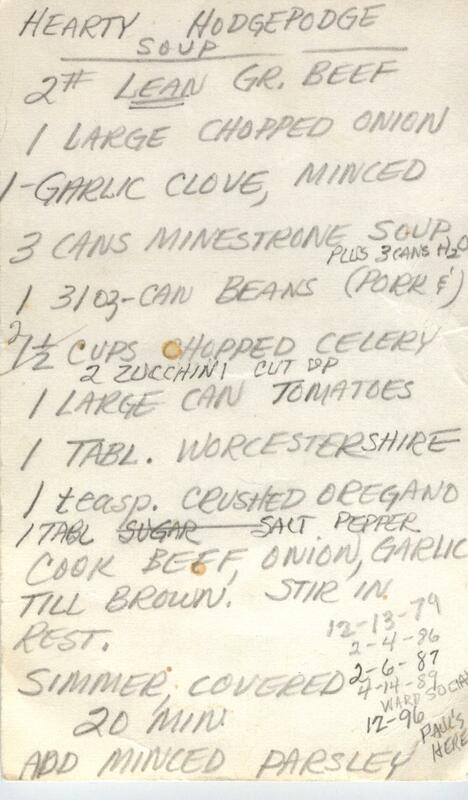 I’ve typed it into my computer and have added my variations, but it always makes me happy to see her original recipe card, and remember her. I’ve made this enough times that I don’t need to refer to the recipe, but I want to preserve this here for the generations to come. Simmer about 20 minutes until the vegetables are cooked. Add fresh parsley if you like. You can also add extra noodles or any other veggies you have–throw it all in, you can’t go wrong! 2 Responses to Hearty Hodgepodge Soup! Thank you, Ann, just what I was looking for! 10/14 Thanks for the new recipe for hodgepodge soup. I love reading, “Ann words” but most of all I love listening to the class….again…in the wee small hours of the morning. You are a blessing to so many. Thank you for giving me the genealogy bug.